A case could be made for pessimism. 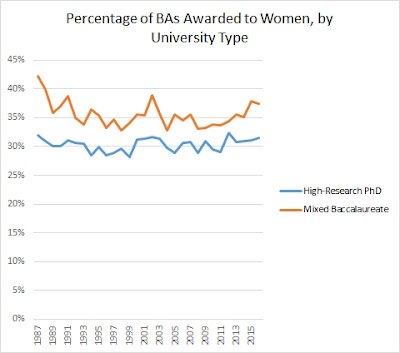 Although academic philosophy has slowly been diversifying in race and ethnicity, the percentage of women receiving philosophy BAs, philosophy PhDs, and publishing in elite philosophy journals has remained virtually unchanged since the 1990s. It seems that we have reached a plateau. Could anything move the dial? I decided to look, institution-by-institution across the U.S., at the percentage of Philosophy B.A. recipients who are women. If there are some "outlier" institutions that have a much higher percentage of women philosophy majors than is typical, we could look more closely at those institutions. Such institutions might have policies or practices worth imitating. For this analysis, I downloaded Bachelor's degree completion data from all 7357 "U.S. institutions" in the NCES IPEDS database for the academic years 2009-2010 to 2015-2016. For each institution, I examined four variables: total Bachelor's degrees awarded (1st major), total Bachelor's degrees awarded to women (1st major), total Philosophy Bachelor's degrees awarded (1st or 2nd major, category 38.01), and total Philosophy Bachelor's degrees awarded to women (1st or 2nd major, category 38.01). 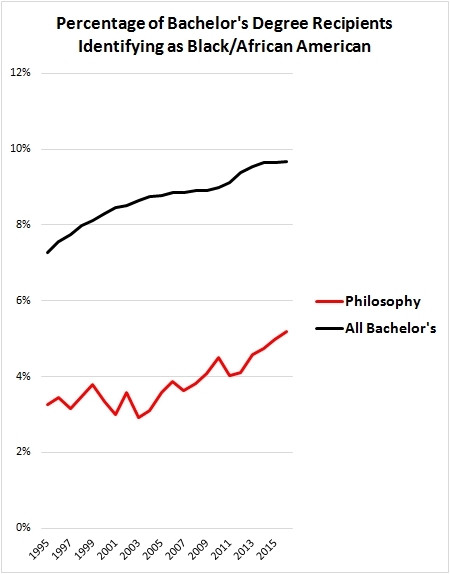 To reduce the likelihood of high or low percentages due to chance, I limited my analysis to the 66 colleges and universities that had awarded at least 200 Bachelor's degrees in Philosophy over the period. Across these 66 institutions, there were 22150 completed Philosophy majors during the seven-year period, of which 7120 (32.1%) were women. (Across all institutions, 61963 Philosophy Bachelor's degrees were awarded (31.6% to women). So the 66 targeted institutions together awarded about 36% of the Philosophy Bachelor's degrees in the U.S.) I then arranged the institutions by percentages of Philosophy majors who were women. One would expect most of these institutions to be within a few percentage points of 32%. My interest is in the statistical outliers. I wanted to be conservative in testing for outliers, so here is how I did it. First, I performed a two-tailed two-proportion z test, comparing the proportion of women Philosophy majors at each target institution to the proportion of women Philosophy majors in all the remaining institutions combined. To correct for multiple comparisons, I used a Bonferroni correction, lowering the threshold for statistical significance from the conventional p < .05 (representing a 5% chance that results at least as extreme would arise from random sampling error) to p < .0008. Ten of the 66 institutions had proportions significantly different from the overall proportion by this measure. However, some of those results might have been due to unusually large or small proportions of women in the overall undergraduate population of those institutions, so I performed a second test also. 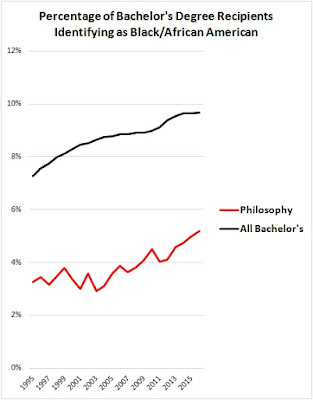 Overall, across all 66 institutions, 1.43% of men graduate with Philosophy majors, compared to 0.58% of women. Based on these numbers, I calculated an "expected" percentage of women Philosophy majors for each institution, based on the number of graduating men and graduating women at that institution: (total graduating women * .0058)/((total graduating men * .0143) + (total graduating women * .0058)). The resulting expected percentages ran from 25% (for Virginia Polytechnic, with a total graduating class of 45% women) to 43% (for Loyola Chicago, with a graduating class of 65% women). I then performed two-tailed one-proportion z-tests comparing the percentage of Philosophy majors who were women at each institution to this expected percentage of Philosophy majors at the same institution, using the same p < .0008 threshold to correct for multiple comparisons. Twelve institutions had gender ratios significantly different from chance by this measure. For my final list of outliers, I included only institutions significantly different from chance by both measures -- that is, schools that both had a significantly higher or lower percentage of women Philosophy majors than did the other institutions and that had a significantly higher or lower percentage of women Philosophy majors than would be expected given the overall gender composition of their undergraduate graduating body. Franciscan University of Steubenville: 17.3% (43/249; vs 63%; < .0001, < .0001). Five more institutions had fewer than 24% women Philosophy majors, with p values < .05 by both measures, but without meeting my stringent criteria for outliers. Due to the nature of multiple comparisons, some of these may appear on that list by chance. University of Washington, Bothell: 72.8% (348/481; < .0001, < .0001). UW Bothell doesn't appear to offer a straight Philosophy major; so I suspect these numbers are due to a potentially misleading decision to classify one of their popular interdisciplinary majors (Society, Ethics & Human Behavior?) as "Philosophy" (38.01 in the NCES classification). I'm looking into the matter. Meanwhile, let's bracket that campus. Between Penn and Scranton were several campuses with higher percentages of women among Philosophy majors, but smaller total numbers of Philosophy majors, and thus not crossing my stringent statistical threshold for outliers: University of Southern California (39.4%), University of Virginia Main Campus (39.4%), University of California Riverside (go team! 39.6%), CUNY Brooklyn (40.1%), Virginia Polytechnic (41.0%), Georgia State (41.1%), Boston University (41.3%), and Cal State Fresno (43.2%). 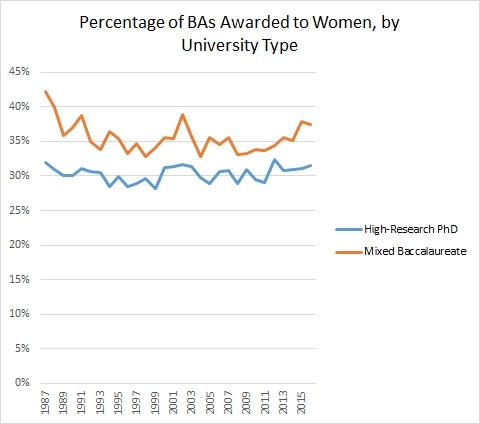 None of these schools had strikingly high percentages of women BA recipients overall (45%-61%, compared to 57% women BA recipients in the US overall during this period and 54% in the 66 selected universities). Among these, U Virginia, UC Riverside, Virginia Polytechnic, and CSU Fresno all have p values < .05 by both measures. Again, due to the nature of multiple comparisons, some of these may appear on that list by chance. 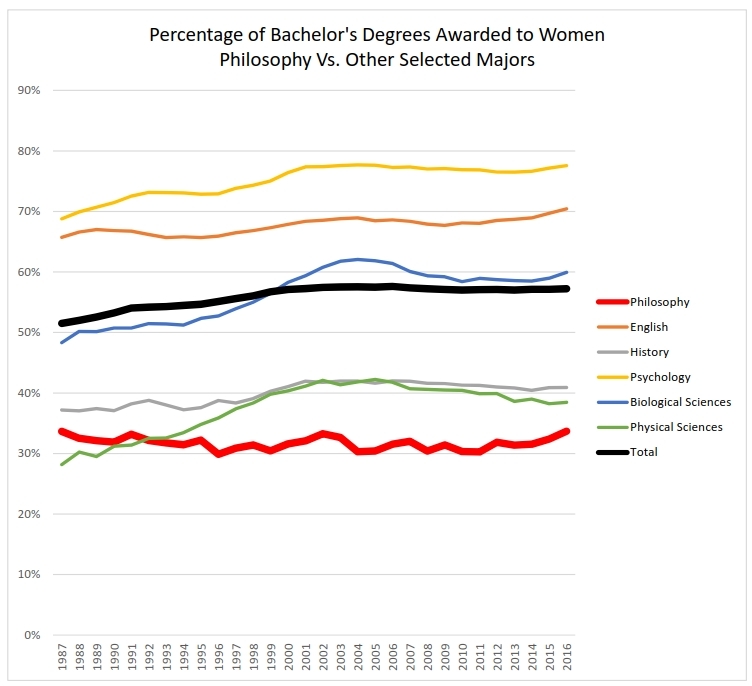 Some colleges and universities have unusually high or low percentages of women philosophy majors as a result of factors that are unlikely to be chance, across a range from about 10%-24% at the low end to about 38%-46% at the high end. 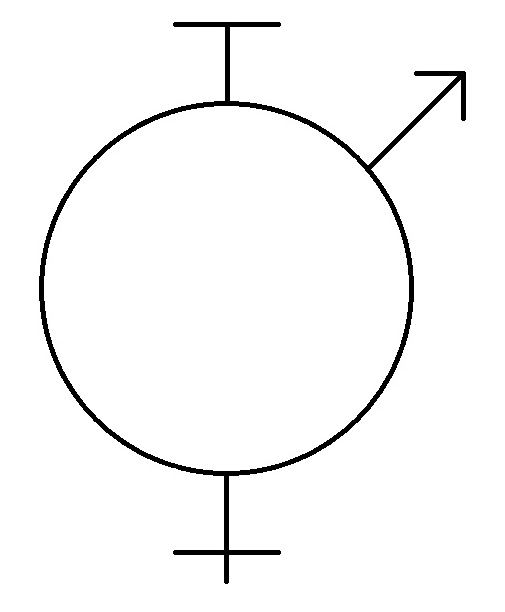 If these differences are due to differences in policies or practices which differentially draw women and men into the Philosophy major, it might be possible for schools near the lower end of this range to increase their percentage of women Philosophy majors by imitating those at the higher end of the range. I don't know what explains the differences. It is striking that the two schools with the smallest percentage of Philosophy majors are both Catholic affiliated, so maybe that is a factor in some way. (ETA: Scranton, one of the high end outliers, is also Catholic affiliated!) Gender ratios among permanent faculty don't to be the primary determining factor. 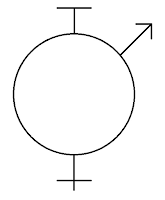 Judging from gender-typical names and photos on the Philosophy Department homepages, women are 5/24 (excl. 1) and 0/8 of permanent faculty at St Thomas and Fransiscan, vs 4/15 and 2/16 at Penn and Scranton. 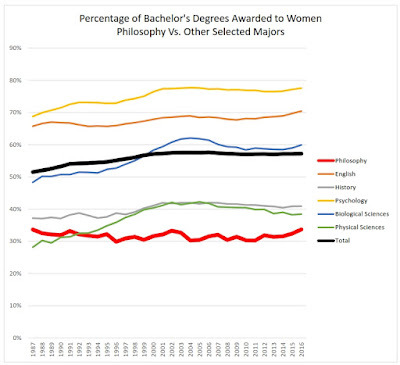 Okay, I have some more data from the NCES database on Bachelor's degrees awarded in the U.S. A couple of weeks ago I noted that women have been earning 30-34% of philosophy BAs since the 1980s. Last week I noted the sharp decline in Philosophy, History, and English majors since 2010. Based on results from my analysis last year on PhDs in Philosophy, I had expected Philosophy majors to be overwhelmingly White. To my surprise, that's not what I found. 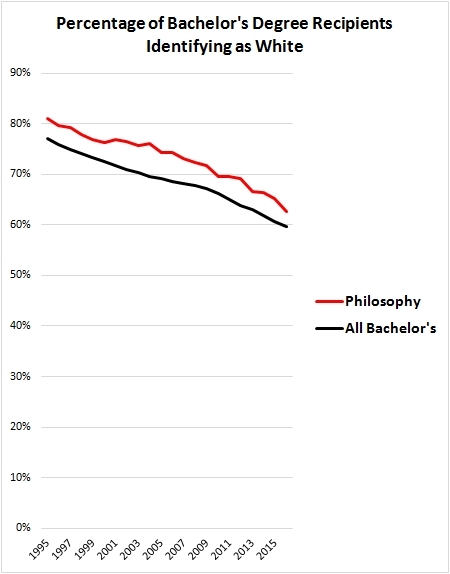 Although recipients of Bachelor's degrees in Philosophy are somewhat more White than recipients of Bachelor's degrees overall, the difference is not large: 63% of BA recipients in Philosophy identified as White, compared to 60% of all graduating majors in the 2015-2016 academic year. In the NCES data, both Latino/Hispanic students and Asian students are approximately proportionately represented among Philosophy majors: 13% and 7% respectively, compared to 12% and 7% of graduating students overall. Of course Latino students are underrepresented among college graduates generally, compared to their prevalence in the U.S. as a whole (about 18% of the U.S. population overall). 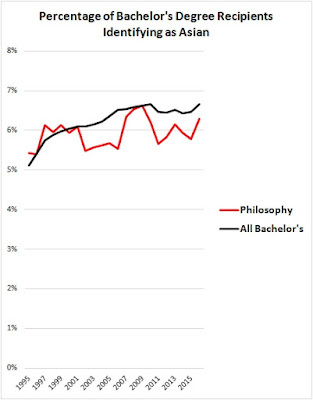 However, they don't appear to be more underrepresented among Philosophy majors than they are among Bachelor's degree recipients in general. 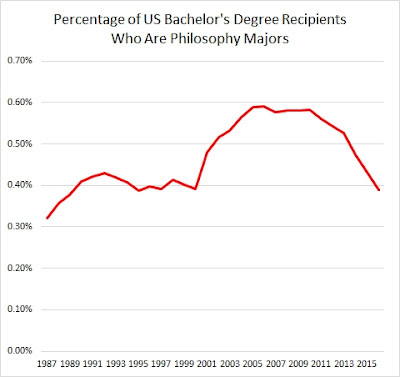 Similarly -- though the numbers are very small -- Native Americans are about 0.4% of Philosophy degree recipients and about 0.5% of graduating students overall (and 1.3% in the general population). In contrast, Black students are substantially underrepresented: 5% in Philosophy compared to 10% overall (and 13% in the general population). Interestingly, these trends also appear to hold over time, back to the beginning of available data in the 1994-1995 academic year. White students are overrepresented in Philosophy by a few percentage points, Black students underrepresented by about as many percentage points, and the other groups are about proportionately represented. These trends persist throughout the broad decline in percentage of White students among Bachelor's recipients overall. Evidently, the disproportionate Whiteness of Philosophy PhD recipients in the U.S. (recently in the mid-80%s, excluding nonresident alien and unknown) is not mostly explained by a similarly large disproportion among B.A. recipients, though the underrepresentation of Black students in the discipline does start at the undergraduate level. I'd be interested to hear what others make of these patterns. Note 1: I looked at all U.S. institutions in the IPEDS database, and I included both first and second majors in Philosophy. Before the 2000-2001 academic year, only first major is recorded. I used the major classification 38.01 specifically for Philosophy, excluding 38.00, 38.02, and 38.99. Only people who completed the degree are included in the data. Before the 2007-2008 academic year, the White and Black categories specify "non-Hispanic", and before 2010-2011, Pacific Islander is included with Asian. In the 2007-2008, "two or more races" is introduced as an option. 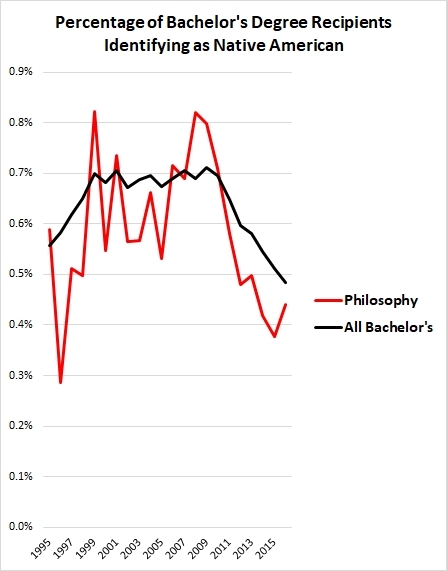 As I was gathering data for last week's post on the remarkably flat gender ratios in philosophy over time, I was struck by a pattern in the data that I hadn't anticipated: a sharp decline in Philosophy Bachelor's degrees awarded in the U.S. since 2010. 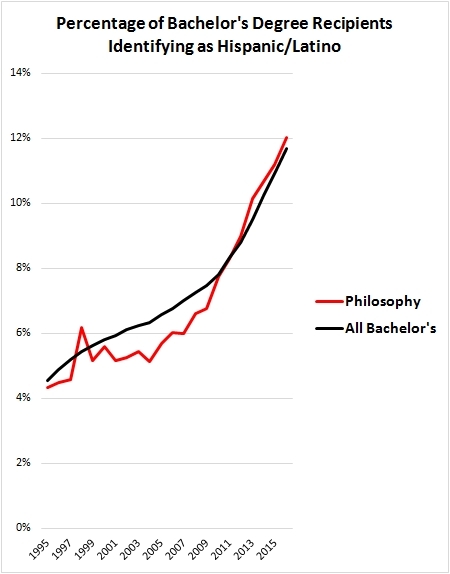 A broader look at the data is partly reassuring, however: There was a similarly precipitous increase in the numbers and percentages of philosophy majors in the early 2000s, as displayed in the graph below. So maybe we're just seeing the pop of a philosophy bubble? I've put the raw numbers for all major categories in CSV here, if you'd like more detail. I'm not sure what to make of this. I suppose Wittgenstein, who reportedly advised aspiring students to major in anything but philosophy, would have approved. Thoughts (and corrections) welcome! In many states, business interests have put pressure on the state government to prepare students for the "jobs of the future". They complain that high school & college graduates don't have the specific skills that they're looking for. Also, there has been more and more emphasis on undergrads to finish in 4 years (for a 4-year degree). In California and many other states, there is a state-sponsored "finish in 4" initiative. They provide funding to the state universities for software & other projects that will help students finish in 4 years. They only way to do this, given all the crazy requirements these days, is to determine your major very early & stick with it. This is definitely the case at CSU. Not sure about UC. I believe this initiative started in CA around 2012. I've been working with CSU since 2014. I'm not saying that this is inherently a bad thing. It's just the environment we're living in. I come from a liberal arts background, and I see the value in being a well-rounded person. I think it comes down to the question "what is the purpose of a state university?" In some states like Wisconsin (where I grew up), there has been a lot of pressure from the (ultra-conservative) state government to dismantle the traditional approach to higher education & research, and turn the emphasis towards job training. Anyway, the pressure for job skills & to finish in 4 years makes it difficult for young people to explore and find their true interests. How many freshman / sophomores know that they're interested enough in philosophy / linguistics / history / etc to declare it that early? I didn't declare linguistics until my very last semester (long story). ETA2 (Dec 18): Some of the bump in the early 2000s is due to changes in NCES reporting. Starting in 2001, second majors are reported, as well as first majors. That accounts for that little jump from 2000 to 2001 (approx 0.40% to 0.48%) but not any of the increase from 2001 onward, after which the reporting remains the same. Note 1: Data from the NCES IPEDS database. I looked at all U.S. institutions in the IPEDS database, and I included both first and second majors. Before the 2000-2001 academic year, only first major is recorded. I used the major classification 38.01 specifically for Philosophy, excluding 38.00, 38.02, and 38.99. Only people who completed the degree are included in the data. Some majors have different classification titles and criteria over the period, so I needed to make a few coding/grouping decisions. The most important of these was disaggregating the History subfield from the "Social Sciences and History" category in the 2000-2001 and 2001-2002 data. 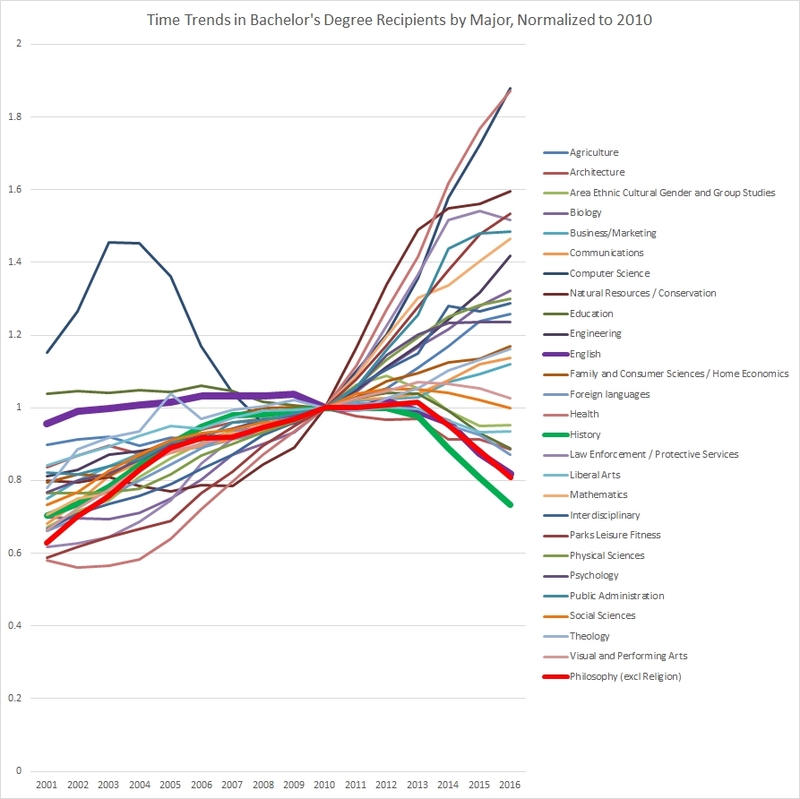 Although there are some category and coding differences over time in the dataset, the 2011-2012 to 2015-2016 academic years appear to have used exactly the same coding criteria. Superficially, dreidel appears to be a simple game of luck, and a badly designed game at that. It lacks balance, clarity, and (apparently) meaningful strategic choice. From this perspective, its prominence in the modern Hannukah tradition is puzzling. Why encourage children to spend a holy evening gambling, of all things? This perspective misses the brilliance of dreidel. Dreidel's seeming flaws are exactly its virtues. Dreidel is the moral world in miniature. For readers unfamiliar with the game, here's a tutorial. 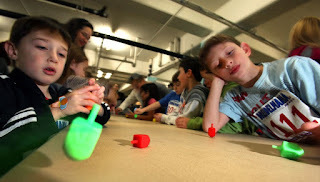 You sit in a circle with friends or relatives and take turns spinning a wobbly top, the dreidel. In the center of the circle is a pot of several foil-wrapped chocolate coins, to which everyone has contributed from an initial stake of coins they keep in front of them. If, on your turn, the four-sided top lands on the Hebrew letter gimmel, you take the whole pot and everyone needs to contribute again. If it lands on hey, you take half the pot. If it lands on nun, nothing happens. If it lands on shin, you put one coin in. Then the next player takes a spin. The first odd thing you might notice is that although some of the coins are big and others are little, they all count just as one coin in the rules of the game. This is unfair, since the big coins contain more chocolate, and you get to eat your stash at the end. To compound the unfairness, there is never just one dreidel — each player may bring her own — and the dreidels are often biased, favoring different outcomes. (To test this, a few years ago my daughter and I spun a sample of eight dreidels 40 times each, recording the outcomes. One particularly cursed dreidel landed on shin an incredible 27/40 spins.) It matters a lot which dreidel you spin. And the rules are a mess! No one agrees whether you should round up or round down with hey. No one agrees when the game should end or how low you should let the pot get before you all have to contribute again. No one agrees how many coins to start with or whether you should let someone borrow coins if he runs out. You could try to appeal to various authorities on the internet, but in my experience people prefer to argue and employ varying house rules. Some people hoard their coins and favorite dreidels. Others share dreidels but not coins. Some people slowly unwrap and eat their coins while playing, then beg and borrow from wealthy neighbors when their luck sours. Now you can, if you want, always push things to your advantage — always contribute the smallest coins in your stash, always withdraw the largest coins in the pot when you spin hey, insist on always using what seems to be the "best" dreidel, always argue for rule interpretations in your favor, eat your big coins and use that as a further excuse to contribute only little ones, et cetera. You could do all of this without ever breaking the rules, and you'd probably end up with the most chocolate as a result. But here's the twist, and what makes the game so brilliant: The chocolate isn't very good. After eating a few coins, the pleasure gained from further coins is minimal. As a result, almost all of the children learn that they would rather enjoy being kind and generous than hoarding up the most coins. The pleasure of the chocolate doesn't outweigh the yucky feeling of being a stingy, argumentative jerk. After a few turns of maybe pushing only small coins into the pot, you decide you should put a big coin in next time, just to be fair to others and to enjoy being perceived as fair by them. Of course, it also feels bad always to be the most generous one, always to put in big, take out small, always to let others win the rules arguments, and so forth, to play the sucker or self-sacrificing saint. Dreidel, then, is a practical lesson in discovering the value of fairness both to oneself and to others, in a context where the rules are unclear and where there are norm violations that aren't rules violations, and where both norms and rules are negotiable, varying from occasion to occasion. Just like life itself, only with mediocre chocolate at stake. I can imagine no better way to spend a holy evening. * for values of "forever" ≤ 30 years. The National Center for Education Statistics has data on the gender of virtually all Bachelor's degree recipients in the U.S. back into the 1980s, publicly available through the IPEDS database. For Philosophy, the earliest available data cover the 1986-1987 academic year. [For methodological details, see note 1]. 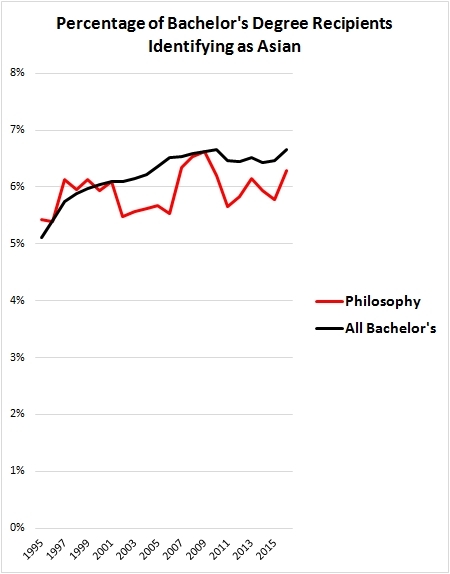 The percentage of Philosophy Bachelor's degrees awarded to women has been remarkably constant over time -- a pattern not characteristic of other majors, many of which have shown at least a modest increase in the percentage of women since 1987. In the 1986-1987 academic year, women received 33.6% of Philosophy BAs. In the most recent available year (preliminary data), 2015-2016, is was 33.7%. Throughout the period, the percentage never strays from the band between 29.9% and 33.7%. I have plotted the trends in the graph below, with Philosophy as the fat red line, including a few other disciplines for comparison: English, History, Psychology, the Biological Sciences, and the Physical Sciences. The fat black line represents all Bachelor's degrees awarded. Philosophy is the lowest of these, unsurprisingly to those of us who have followed gender issues in the discipline. (It is not the lowest overall, however: Some of the physical science and engineering majors are as low or lower.) To me, more striking and newsworthy is the flatness of the line. 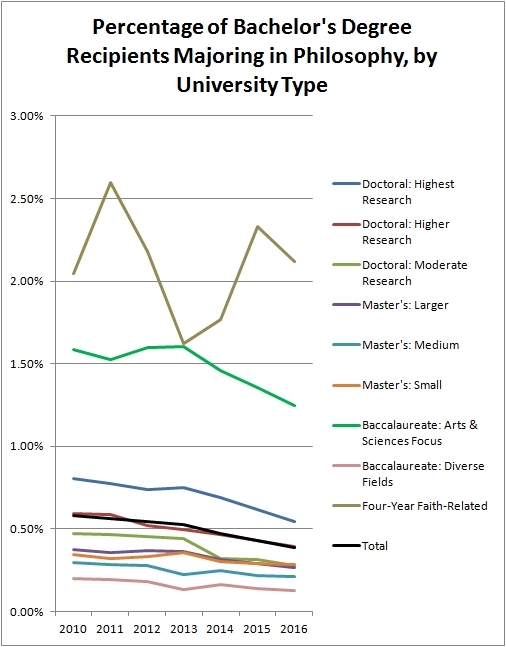 I also thought it might be worth comparing high-prestige research universities (Carnegie classification: Doctoral Universities, Highest Research Activity) versus colleges with much more of a teaching focus (Carnegie classification: Baccalaureate's Colleges, Arts & Science focus or Diverse Fields). For kicks, I thought I'd also check if my home state of California was any different -- since we'll be seceding from the rest of the U.S. soon (JK!). Nope. Again, a flat line, with women overall 33% of graduating BAs in Philosophy. 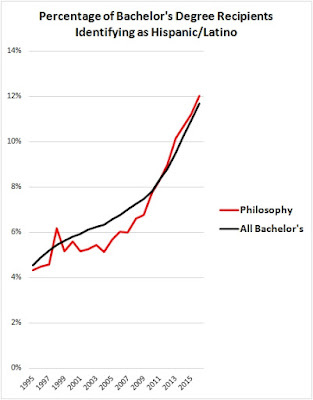 Presumably, if we went back to the 1960s or 1970s, a higher percentage of philosophy majors would be men. But whatever cultural changes there have been in U.S. society in general and in the discipline of philosophy in particular in the past 30 years haven't moved the dial much on the gender ratio of the philosophy major. Note 1: I looked at all U.S. institutions in the IPEDS database, and I included both first and second majors. Before the 2000-2001 academic year, only first major is recorded. I used the major classification 38.01 specifically for Philosophy, excluding 38.00, 38.02, and 38.99. Only people who complete the degree are included in the data. 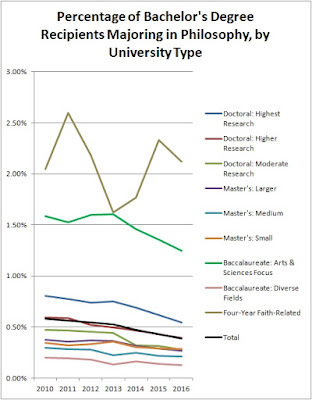 Although gender data are available back to 1980, Philosophy and Religious Studies majors are merged from 1980-1986. I've been working on this essay off and on for years, "Aiming for Moral Mediocrity". I think I've finally pounded it into circulating shape and I'm ready for feedback. I have an empirical thesis and a normative thesis. The empirical thesis is that most people aim to be morally mediocre. They aim to be about as morally good as their peers, not especially better, not especially worse. This mediocrity has two aspects. It is peer-relative rather than absolute, and it is middling rather than extreme. We do not aim to be good, or non-bad, or to act permissibly rather than impermissibly, by fixed moral standards. Rather, we notice the typical behavior of people we regard as our peers and we aim to behave broadly within that range. We -- most of us -- look around, notice how others are acting, then calibrate toward so-so. This empirical thesis is, I think, plausible on the face of it. It also receives some support from two recent subliteratures in social psychology and behavioral economics. One is the literature on following the (im-)moral crowd. I'm thinking especially of the work of Robert B. Cialdini and Cristina Bicchieri. Cialdini argues that "injunctive norms" (that is, social or moral admonitions) most effectively promote norm-compliant behavior when they align with "descriptive norms" (that is, facts about how people actually behave). People are less likely to litter when they see others being neat, more likely to reuse their hotel towels when they learn that others also do so, and more likely to reduce their household energy consumption when they see that they are using more than their neighbors. Bicchieri argues that people are more likely to be selfish in "dictator games" when they are led to believe that earlier participants had mostly been selfish and that convincing communities to adopt new health practices like family planning and indoor toilet use typically requires persuading people that their neighbors will also comply. It appears that people are more likely to abide by social or moral norms if they believe that others are also doing so. The other relevant literature concerns moral self-licensing. A number of studies suggest that after having performed good acts, people are likely to behave less morally well than after performing a bad or neutral act. For example, after having done something good for the environment, people might tend to make more selfish choices in a dictator game. Even just recalling recent ethical behavior might reduce people's intentions to donate blood, money, and time. The idea is that people are more motivated to behave well when their previous bad behavior is salient and less motivated to behave well when their previous good behavior is salient. They appear to calibrate toward some middle state. My normative thesis is that it's morally mediocre to aim for moral mediocrity. Generally speaking, it's somewhat morally bad, but not terribly bad, to aim for the moral middle. In defending this view, I'm mostly concerned to rebut the charge that it's perfectly morally fine to aim for mediocrity. Two common excuses, which I think wither upon critical scrutiny, are the Happy Coincidence Defense and The-Most-You-Can-Do Sweet Spot. The Happy Coincidence Defense is an attractive rationalization strategy that attempts to justify doing what you prefer to do by arguing that it's also for the moral best -- for example, that taking this expensive vacation now is really the morally best choice because you owe it to you family, and it will refresh you for your very important work, and.... The Most-You-Can-Do Sweet Spot is a similarly attractive rationalization strategy that relies on the idea that if you tried to be any morally better than you in fact are, you would end up being morally worse -- because you would collapse along the way, maybe, or you would become sanctimonious and intolerant, or you would lose the energy and joie de vivre on which your good deeds depend, or.... Of course it can sometimes be true that by Happy Coincidence your preferences align with the moral best or that you are already precisely in The-Most-You-Can-Do Sweet Spot. But this reasoning is suspicious when deployed repeatedly to justify otherwise seemingly mediocre moral choices. Another normative objection is the Fairness Objection, which I discussed on the blog last month. Since (by stipulation) most of your peers aren't making the sacrifices necessary for peer-relative moral excellence, it's unfair for you to be blamed for also declining to make such sacrifices. If the average person in your financial condition gives X% to charity, for example, it would be unfair to blame you for not giving more. If your colleagues down the hall cheat, shirk, lie, and flake X amount of the time, it's only fair that you should get to do the same. The simplest response to the Fairness Objection is to appeal to absolute moral standards. Although some norms are peer-relative, so that they become morally optional if most of your peers fail to comply with them, other norms aren't like that. A Nazi death camp guard is wrong to kill Jews even if that is normal behavior among his peers. More moderately, sexism, racism, ableism, elitism, and so forth are wrong and blameworthy, even if they are common among your peers (though blame is probably also partly mitigated if you are less biased than average). If you're an insurance adjuster who denies or slow-walks important health benefits on shaky grounds because you guess the person won't sue, the fact that other insurance adjusters might do the same in your place is again at best only partly mitigating. It would likely be unfair to blame you more than your peers are blamed; but if you violate absolute moral standards you deserve some blame, regardless of your peers' behavior. Full length version of the paper here. As always, comments welcome either by email to me or in the comments field of this post. Please don't feel obliged to read the full paper before commenting, if you have thoughts based on the summary arguments in this post.